A very relaxing day here at Rock Glen resort. Fixed our levelling jacks too! Now we are having cooler weather, but not cold. A nice shady spot temps into the low 80's F (27c) , nice breeze really can't complain. Yesterday our levelling jacks had blown a fuse, again. So this morning I did some investigating and think I found the problem. 2 blown fuses. At least they are working fine again. 2nd time in 10 years, but and easy cheap fix. Our internet is sporadic as I said yesterday so Suzie actually when shopping with me today. Once we leave the valley here in the park is our Rogers internet works fine. Into Forest 10 minutes away they have a small farmer's market on friday. Local farmers selling what's in season. After many walkabouts and chatting with so many people time to relax in the shade with our e-readers. It is wonderful! Then time to try our a new beer here only available in Canada. Bud Light Apple, nice and refreshing, definitely apple flavored and not too sweet. Then time to begin supper. Making some corn Kabobs and smoked pork chops. When we have better internet I will post the recipe. That was our wonderful day, and hope you had a good one too. Check out the interactive map below to see where we have been this Spring and Summer. Up early as usual, got my walkabout town and get ready to hit the road. Jacks up and our towed in place we hit the road by 9am. Took a slightly longer route today wanted to stop at Honey Wood tire in Stratford to get a price on 2 new tires for the front of our coach. Much more expensive than the last time replaced them 7 years ago, but want to do it this summer before we head south this fall. He has the Michelins in stock so we will stop in and have them installed in a couple weeks when we drive by again. Carried on to Rock Glen resort in Arkona, gonna hang out her for a couple weeks. Arrived about 11:30 and picked out a nice site "InThe Valley" full hookups complete shade and a nice breeze. Temp only about 75 f almost feels chilly compared to out in the sun and where we have been. All setup by noon then a light lunch. Got to enjoy a few walkabouts, chat with some friends and even had time to read for a while. Working an an issue with a fuse holder for our levelling jacks, not a big deal so can wait till tomorrow. We had a nice visit for a while, they are just going on the road fulltime, house sold and purged. We wish them well and happy travels wherever you go. Thanks for stopping in and hope you had a great day too. Because of the Canadian long weekend and our location our internet is sporadic so not quite sure when this will be posted. The weather guesser was wrong, this was not the hottest day of the week. Think yesterday was. The weather guessers got it wrong today it was supposed to be in the 90's f with humidex about 108 f. and we were ready to enjoy it. Some early morning walkabouts and errands, even mowed the rest of the lawn here before noon. Think the high got to 88f, with humidex only 96f. Now thats quite comfortable for us. We did go for only one dip in the pool and that was enough we were good for the rest of the day. Not that we are complaining but were looking forward to a few swims all day long. It was wonderful relaxing afternoon, just putter around a bit and get some reading time in, we both do love reading. Before we know it time for supper so I fired up our Weber Q and made a tasty salad, the Pacific Salmon fillet on the grill about 12 minutes and was excellent. It was a great day and sure can't beat the weather. Tomorrow we hook up the car and head about 90 minutes west to Rock Glen Resort for a couple weeks. It is our membership home park so we have no overnight fees with full hookups and lots of great facilities. A nice change but it will be a busy place, (long weekend and all) we can deal with that, a nice shady spot off in a corner somewhere. Hope you had a great day too. Glad that you came by for a visit again. Not much different than yesterday, but did get to visit some family members again. Nothing exciting here today. just more wonderful hot weather with, no wind and no cloud cover feels like 100f. Not a problem here for us. After my early morning walkabouts and a few errands dropped Suzie at her mom's in New Hamburg and I whipped into Kitchener for a nice visit with my ma. Just home for a bite for lunch then visit with daughter number 2 and drop off a birthday card for grandson number 4. Gonna be 8 yrs old on Thursday, wow! Now back here to camp awesome gonna mow a bit more lawn, only about an hour in this heat, not too good for the mower. Then just before 4pm Suzie and I enjoyed a very refreshing dip in the pool; here, all to ourselves and the water temp close to 84f . Now we good to go for the rest of the day. Time to fire up our Weber Q grill a whole chicken and enjoy a cold beverage in the shade with some quality reading time done. Supper done and cooled down a bit I hopped on the mower for another 45 minutes finish off the rear one acre. Only about 45 minutes to finish off the front tomorrow. Same as last night I fired up the genny turned on both A/C units and in about and hour our coach cooled from 91f to 74f. Perfect, open the windows and turn on the fantastic fan we good for the night again. 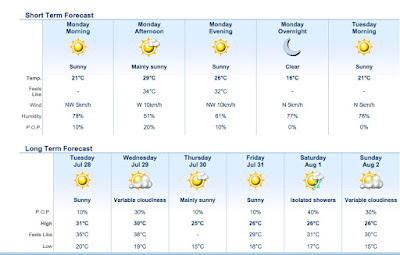 Now this is summer time weather that we love here Ontario, short lived but will enjoy every minute of it. Thanks for taking the time to drop on by, hope your day was wonderful too. Sunny and hot , what we enjoy, but had to run our A/C for an hour or so tonight. Gonna be a hot one today and we don't mind that at all. Because we spend the day outside in the shade puttering around, go for a couple swims etc. And I even mowed the lawn for a bit, only an hour though. I have 3 days of hot weather to get it done before we leave the area. And don't want to overheat the mower. With temperature feeling like 34 C (94f) and no breeze inside our coach was still about 90f at 7:30 tonight. So I broke down and fired up our generator to cool things down for an hour or so. Does not take long with both a/cs running. Not enough power here to run even one ac with a 200 ft extension cord on a 15 amp plug. Plus good to exercise both the genny and a/cs once in a while anyway. The pool is refreshing and a few minutes sure does work great, no one else using it anyway. About 4 o'clock Suzie go see her Mom again while I prepped supper for when she returned at 6 pm. Tonight a couple wild sockeye burgers that we picked up at the market last saturday from Caudles Catch, they have some excellent seafood, Wish we could buy more but only have so much freezer space. That was a wonderful way to spend a hot summer day in the country, under a shade tree, reading and a few dips in the pool. 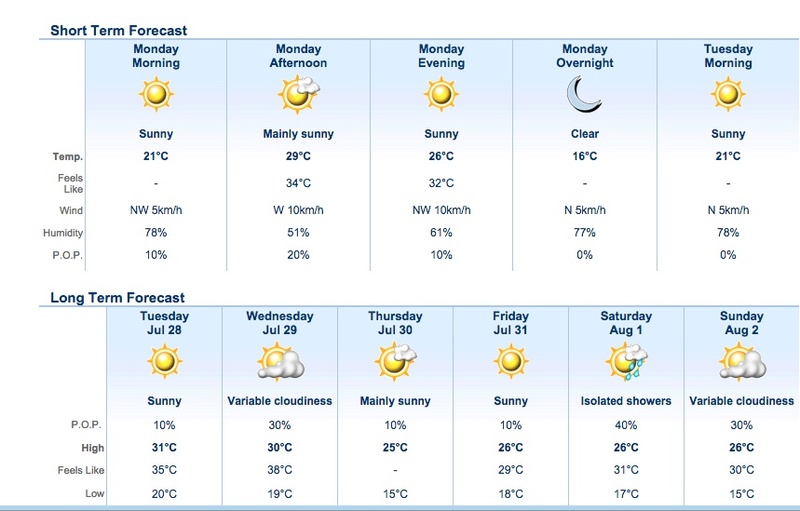 What not to like and even the next 2 days are supposed to be hotter, oh yeah we ready for it! Thanks for stopping in again and hope you made it through or enjoyed your hot weather too. 80 minutes with the genny going and our coach is a almost cold 74f outside temps now about 76f we good to go now. Hot sunny and a visit from old and new friends. Love it ! Sunny hot Sunday again we loving it. The usual morning walkabouts town, chat with the guys at the garage and back home to just putter around for a bit. W hip up a light lunch, read for a bit and dip in the pool. Relax and read some more enjoying this wonderful summer weather, the one thing we like about summer here in Ontario. We having friends drop by this afternoon that we have not seen for a couple years. They brought along another couple (Connie and Fred) that are going full time this year and wanted to pick our brains. We talked, we chatted, we shared ideas but some of these people getting too warm. Also getting time for supper after a few hour, so down to the Trail's Edge in town, good food and air conditioned for those who needed it. So we have a great feast and enjoyed more conversation with these people. They are so excited to be hitting the road later this summer, Wish them good luck and happy trails. Supper done then back home Mike would love this ride, (me too) but was not meant to be. Back to camp awesome for a bit then said our goodbyes, see y'all later hopefully sooner than later. Was a wonderful afternoon catching up with old friends and making new ones at the same time. Soon to call it a night all this fresh air and exercise sure wears ya out. Thanks agin for stopping on by. Saturday Market and a wonderful day . Hey this is Saturday and gonna be a hot one! So the early morning walkabouts and when Suzie ready to head out (after her shower) to the Farmer's Market in St' Jacobs, by 9 am. So much to see and do there and the fresh fruits and vegetables are in season. We were at this same market last Saturday and posted a lot of Pics. If you missed them you can look back by clicking HERE. You can spend many hours checking things and buying all the stuff there. But we know what we want and where to find it so managed to get through in just over 2 hours. We soon leaving this area for a few weeks so last chance to get some good stuff. Once here we pass a few buskers, always nice to see them here always different ones. We did make a few purchases, Turkey garlic sausage, beefsteak tomatoes, fresh peaches from Niagara, fresh cherries at excellent and good prices too. Back home a some fresh fruit for lunch and I made up this Cucumber Tomato salad for supper for the recipe click HERE or my recipe blog top right side bar. Now to relax in the shade and read with nice breeze, even on this hot day close to 90f. Was gonna go for a dip in the pool but it cooled down slightly with some cloud cover, so just had to read some more and a few walkabouts too. Also had 2 cobs of corn we picked up. Like to soak them in water, and grill, but seeing as we are almost dry camping I wrap the in foil and set on the Q, This works well too. A cook a couple Turkey garlic sausage, these are excellent, very lean and lotsa garlic. That was our wonderful summer saturday, thanks for stopping by and hope you enjoyed yours too. Not much happening today just the way we like it, Early morning walkabouts town, putter around and off to New Hamburg. Dropped Suzie at her mom;s and I got some grocery shopping done. She send me a text when ready to come home and we back here for a nice light lunch. Read for a bit then a cut some grass with the small gas powered lawn mower but worked up a sweat and had to cool off in the pool. Darn pool is too nice I tell ya. It's pretty warm her, and the pool was refreshing at 82F (28c), perfect! Read a bit more, walbaout a bit so peaceful and watch the bunnie's hopping about. Relaxing out here is amazing, then my next fun thing to do is whip up supper. Make a salad, fire up our Weber Q a grill a nice pork loin roast, fresh tomatoes with garlic goat cheese and a cored apple with cinnamon sprinkled in the centre. The day once again flew by loving this amazing summer weather. This was a great relaxing day, whats not to like. Hot , humid, relaxing and loving it ! More family fun but at a slower pace. Lots to say but no time right now..
What a wonderful peaceful day we had! Perfect summer day, and family fun on Friday. Thursday taking it easy and having fun.